It's got one of the worst, slimiest titles ever, the title is really a shame, don't let the title of the book turn you off. I think it really should have been called "How to be considerate" because it's really the best book I've ever seen about how to think of things from the other person's point of view. That's what the whole book is about. It was written back in the 1930s, it's a classic. And I think that that's really the underlying thing behind all of the best marketing, it's thinking things from other person's point of view, it's thinking how to be considerate, it's... you know, when somebody wants to find some new music, what are they thinking when they're looking for new music? Are they thinking about your introspective lyrics or your great drum fills? Or are they thinking about having some shockingly unique sound that doesn't sound like what they've heard before? Learning to think things from the other person's point of view, I think "How to Win Friends and Influence People" - that book is my top recommendation. "I [note: Tim Ferriss] asked Cal, "If you were a billionaire and could give 2 to 3 books to every graduating high school senior in the country this year, what would they be?" His answer (updated since the podcast) is: "For everyone: How to Win Friends and Influence People by Dale Carnegie. For females: West with the Night by Beryl Markham. For males: The Right Stuff by Tom Wolfe. That's a good start for a journey". Despite its name, it's not necessarily about going out and making friends, but instead, it will alter how you communicate with people in general. This makes it very valuable for anyone to read. Business books, I also recommend the classics. Anything that can stand the test of time is proven great knowledge that is effective. How To Win Friends And Influence People, constantly on the Amazon best-seller list. Small hacks to make people you just met like you better. Sounds manipulative but actually makes you genuinely appreciate them more. Reading How To Win Friends And Influence People when I was young and realizing how important empathy is. Putting something in someone else’s best interest rather than your own. Few books that were written nearly a century ago are still as true and eloquent today as they were then, but Dale Carnegie’s work is certainly one of them. My favorite book is usually a recent one that helped me with a particular task or question. In the last year, I’ve been working (and studying) more about online influencers. In this context, two books come to mind: one that really inspired me on how to work better with people -- the classic How to win friends and influence people by Dale Carnegie. Now that I look at the books listed, they seem to carry an existential theme. I guess I like to understand humanity and human behaviour ultimately to better understand myself. I find reading a means to connect with people who may have lived before my time, or in a distant country, that I may never have had the chance to connect with in real life. As three-dimensional humans, we are all made up of so many faces and emotional layers that we find it hard to dissect them all, and when we find writers who can explain these thought processes in a way that’s tangible and digestible, there’s this incredibly comforting eureka moment of feeling understood. The book that helped me almost instantly was How to Win Friends and Influence People, by Dale Carnegie. It's a book from the 40s, I believe, and I was reluctant to read it because of its title. The title sounds like a self-help book mixed with magic spells and incantations. But in reality it offers very easily digestible tips on how to be approachable, how to negotiate, how to diffuse conflicts... Everything that's very useful for founders who are navigating their team, investors, and users. I used the advice in the book first when I started doing customer support, and it was pretty incredible how easy it was to take a user that's angry and aggressive, and make him happy and an actual supporter who posts about our product and good customer support on their social media. Dale Carnegie explains how to understand where people are coming from and how to react to that, instead of reacting to their words. Dale Carnegie's, How to Win Friends and Influence People is an old book from the 1930's but its simplicity on an important topic will always be relevant. It was nice to read that subconsciously I was applying many of the recommended techniques but certainly made me more aware being sure to apply them. In particular, I do try to help people first and when networking at an event, listen more about them than talking about myself. When asked what books he'd recommend to young people interested in the same career path, Darren Chua mentioned How to Win Friends and Influence People. The classic! Really enjoyed his writing style and provided an interesting perspective on expanding business and personal relationships. I am also reading How to Win Friends and Influence People as this is who I have been a likened too. I run workshops in How to Influence and Persuade…and it's great to see how these concepts from 1936 are still the same today. - as I always say - human behaviour worldwide has not changed. We still feel and buy the same way - you think by now we should all be masters at communication and yet I still meet so many business owners world-wide that haven’t implemented these concepts. Favourite business-related book is "How to Win Friends and Influence People" by Dale Carnegie. When I got my first internship the boss recommended it to me, and I didn't read it for ages because the title sounded a bit manipulative. But the content is not about manipulating people at all, it's about how to be a better person. Lots of good advice, although I don't apply it as well as I should. I get lots out of it each time I re-read it. Also, the 7 Habits of Highly Effective People (Stephen R. Covey) and How to Win Friends and Influence People (Dale Carnegie) had a big impact on how I interact with other people at work and in my personal life. When asked what books he would recommend to youngsters interested in his professional path, David mentioned How to Win Friends and Influence People. For business it's harder to pick a clear winner, but I've read "How to win friends and influence people" by Dale Carnegie quite a few times. It is very rare for a business book that it is packed with invaluable advice, to be so easy and enjoyable to read. The fact that the tone and style is quite dated just adds to the fun in reading it and proves how valuable it still is. I recently recommended this book to my brother who has never read a business book before, and he said it totally changed how approaches dealing with everyone. Self-help classics like The 7 Habits of Highly Effective People and How to Win Friends and Influence People teach principles I still apply today at work. Books didn't change my career path, people whom I knew and interacted with did. In How to Win Friends and Influence People the light switched on as how I should network and build relationships on and offline. Rework, Getting real and Remote - The combo from Fried and DHH. Most of these books are 25 years old or more (Not A Curious Mind).... But the books you read when you are young set the patterns and habits that impact you. I read these when young and they had real impact on my succes. 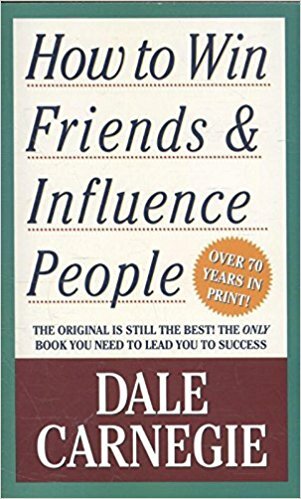 Another book that influenced the way I think is the classic “How to Win Friends and Influence People” by Dale Carnegie. I only wish that I’ve read it sooner. If you know any 17-18 years old, give this book to them as a present! Honestly, it’s not really as simple as following a career path, at least not anymore. I’d recommend instead reading books on innovation and leadership because that can give you the confidence you need to blaze your own trail and to take your career as it comes. I’d suggest that a good background reading list would include How to Win Friends and Influence People by Dale Carnegie. While I was reading "How to Win Friends and Influence People" I suddenly started to realize what people are saying beneath their words and what they actually wanted to say rather than what they said. This really helped me in filtering out the best people in my life. This book is like an "Interpersonal Skills 101" course. It was published in 1936, but is still highly recommended by most successful people today!